How tender and light it was! Those children laughing and shouting at these red-nose-less clowns. Those adults, nearly teary-eyed, in front of Cirque Plume’s farewell. 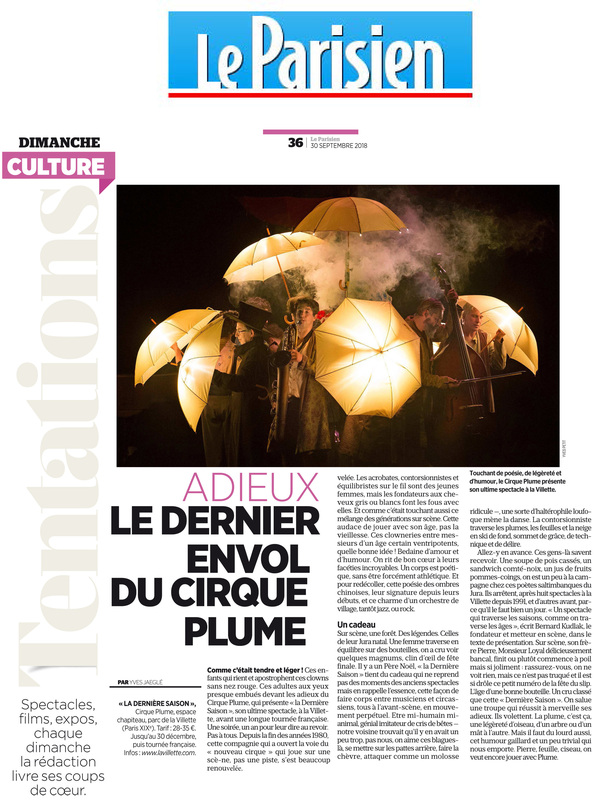 “La Dernière Saison,” Plume’s final show, will have a full run at La Villette before touring across France. An evening, a year, to say goodbye. Not to everyone. Since the late 1980s, the company who paved the way towards the "nouveau cirque," performing on a stage and not in a circus ring, has greatly reinvented itself. The acrobats, contortionists and tightrope walkers are young women, but the gray and white haired founders are reveling right there with them. How touching it was to have this mix of generations on stage, this audacity to play with one’s age and not one’s “old age.” This clowning between pot-bellied men of a certain age, what a good idea! Those bellies of love and humor. We laugh heartily at their incredible antics. A body is poetic, without necessarily being athletic. And to take off once again, we have the poetry of shadow puppetry, Cirque Plume’s signature since their beginnings, and the charm of a village orchestra, then little jazz, then a little rock. On stage, a forest. Legends. Ones from their home in the Jura. A woman crosses the stage, balancing on bottles. We thought we saw a few magnums: a nod to the final party. There is a Santa Claus. "La Dernière Saison” holds a gift — one that does not repeat moments from the troupe’s older shows, but that remembers the essence, that way of music becoming one with circus, at the very tip of the stage, in perpetual motion. The spectator beside us thought it was a little too much, this being half-human, half-animal, the genial imitator of animal cries, but not us. We love these jokes: standing on one’s hind legs, acting like a goat, attacking like a ridiculous watchdog — a kind of zany weightlifter leading a dance. Wearing cross-country skis, the contortionist moves through feathers, leaves, and snow, in a summit of grace, technique, and delirium. Arrive early. These people know how to host. A split pea soup, a sandwich with nuts and comté, an apple-quince fruit juice — we’re a bit out in the country with these traveling performer-poets from the Jura. After having brought eight shows to La Villette since 1991, and others before that, they’re stopping, because one day, one must. "A show that passes through the seasons as we pass through the ages," wrote Bernard Kudlak, the founder and director, in the show notes. On stage, his brother Pierre, the bandleader, teeter tottering about in the most delicious way, finishes or rather starts naked but in such fine form. Rest assured, we do not see anything, but it’s for real and it is so funny, this underwear-party act. The age of a good bottle of wine. A cru classé, this "Dernière Saison." We salute a troupe who can say goodbye so successfully. They flutter. A plume, a feather, is just that: the lightness of a bird, against a tree, or from one mast to another. But it also takes some weight, that cheerful and somewhat trivial humor that carries us away. Stone, sheet, chisel, we still want to play with Plume.